Ingrown nails are prone to occur mainly in the toenails.The corner of the nail bites inside and give you pain.Ingrown tow nails affect walking and posture and cose pain at the waist and knee. ✽Excessive pressure on nails: Shoes that are too small, high-heeled shoes, pointed tow shoes squeeze the nails. The thumb of the hallux valgus may pressure the index finger. ✽Deep nail cutting: When a force is applied to the foot, the skin surrounding the nail is swollen, and the nail does not extend straightly and it rolls inward. ✽No force is applied to the toes: When walking, since the force from the ground keeps the nails flat, it is bedridden, usually does not walk much, as if walking is not going into force on the toes, both ends of the nail bites inward. Using general medical equipment designed by a Japanese doctor for the nail care.The treatment is about 10 minutes for one tow and there is no pain.Wire clip do not noticeable, you can also enjoy nail polish from the top. It is also attractive that you can try it easier than surgery at a medical institution. It is designed based on the voice of the medical field and has been approved for general medical equipment. 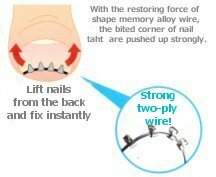 Shape memory alloy wire will instantly pull up the corners of ingrown nails.Immediately after wearing it,you can feel relieve from biting,pressuer and pain (There are individual differences of feeling.) Correction will proceed within about one week and it will be kept until the appliance is removed. A powerful clip on the wire grasps the nail firmly and fixes it. 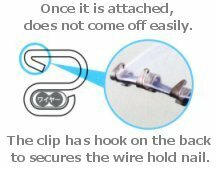 The wire can not be seen from the surface of the nail. A small clip of 1.5 mm in width is just visible at the tip of the nail. Please fill in the medical chart for grasping constitution and physical condition. Feel free to ask any thing what you wish to know. Wipe off dirt around and inside of the nails with cotton. Prepare nail in a state suitable for wear the wire. Attach the wire clip to the tip of the nail and cut the extra wire. If the nail is thin (less than 1 mm in thickness) to hold clip, brittle or secure it more, use special glue to fix it on nail.To avoid damage socks and tights,cover the clips with glue is effective. ✽Although there are individual differences, you can continue wearing it for about 1 month to 2 months. After nail grow and hindered everyday life, please cut your nails with the wire clip attached.Tools can come off with the cut nails. ✽During treatment ingrown tow nail with clip, if you feel scratching,irritation,discomfort and rash,immediately remove it (Put the tip of tweezers on the back side of the clip and push it out to remove).And please consult your doctor. ✽Even if the nail is relaxed, it may return to its original position when you stop using it. ✽Please be careful as there is the possibility of breaking socks and tights. ✽It is inpossible to apply clip if your nails are too short. The white part floating from the toe's finger needs 2.5 to 3 mm. ✽Please do not cut the end of the nail round, it must be If you cut the edge round, please extend the nail tip until it is the same length. cut (both ends should be as perpendicular as possible). If you cut the edge round, please wait until couners grow more and you can cut as If you cut the edge round, please extend the nail tip until it is the same length.